This book examines the post-ceasefire evolutions and histories of the main Irish republican terrorist factions, and the interconnected character of politics and militarism within them. 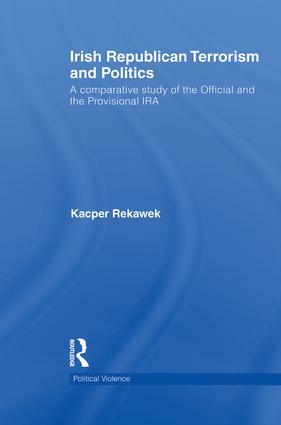 Offering the first comparative study of the two leading Irish republican terrorist movements the Official IRA and the Provisional IRA (PIRA), this book presents the lesser-known Officials’ political-military evolution and analyses whether they could have been role models for the Provisionals. Not only does it compare the terrorism and the politics of the Officials and Provisionals in the aftermath of their seminal ceasefires of 1972 and 1994, it also presents the Irish republican history in a new light and brings to the fore the understudied and disregarded Officials who called their seminal ceasefire twenty-two years before their rivals in 1972. In doing this, the work discusses whether the PIRA might have learned lessons from the bitter and ultimately unsuccessful experience of the Officials. This book goes beyond traditional interpretations of the rivalry and competition between the two factions with the Officials usually seen as non-violent but unsuccessful and the Provisionals less politically inclined and mostly concerned with their armed struggle. Simultaneously, it dispels the myth of the alleged Provisional republican copying of their Official republican counterparts who seemed ready for a political compromise in Northern Ireland more than twenty years before the Good Friday Agreement of 1998. Finally, it comprehensively compares the Officials and the Provisionals within the identified key areas and assesses the two factions’ differences and similarities. . This book will be of much interest to students of Irish politics, terrorism studies, security studies and politics in general. Kacper Rekawek is an adjunct assistant lecturer at the Warsaw School of Social Sciences and Humanities and an international security analyst at the Polish Institute of International Affairs. He has a PhD in International Relations from the Queen's University of Belfast.